Senior Special Assistant to Ekiti State Governor on Public Communications, Segun Dipe, has described the immediate past governor of the State, Mr. Ayo Fayose, as a numbskull who does not know jack in governance. Dipe was reacting to Fayose’s utterances on his personal radio station, People’s FM, where he fielded questions on issues pertaining to his (mis)governance of the state between 2014 and 2018 and the legacy he left behind. While reading his State of the State address on Thursday 24 January 2019 to mark his first 100 days in office, Governor John Kayode Fayemi noted that the debt profile of Ekiti State as at 16 October 2018, when he took over from Fayose stood at N155,791,785,214.08. 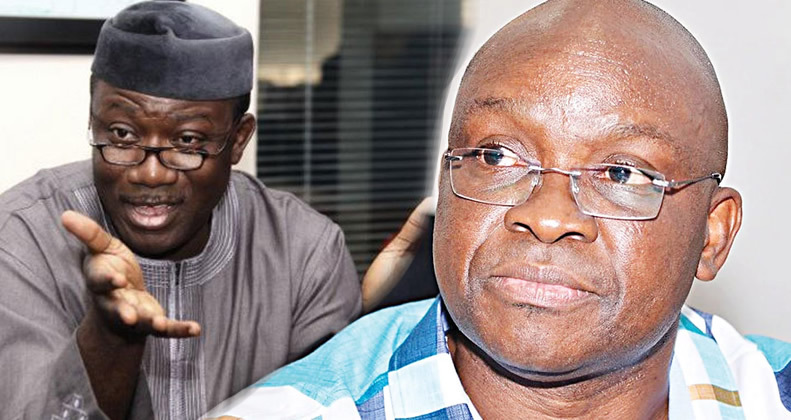 According to the governor, the figure, which was revealed by PriceWaterHouse Coppers, the globally acclaimed auditing firm hired by Ekiti State government to objectively assess the financial position of Ekiti State as at 16 October 2018, showed the state’s debt details were as follows: Loans – 57,694,460,298.79, Salary Arrears – 16,777,257,608.52, Outstanding Leave Bonus – 4,402,585,167.53, Outstanding Corpers’ Allowance – 28,883,959.00. But denying his culpability, Fayose said he did not out-rightly make any borrowing during the period in question, thus could not be accused of leaving any debt behind. Dipe wondered why Fayose, a two-term governor of the state could be displaying such crass ignorance of how governance works with such statement. For Fayose to think outright borrowing is what could constitute indebtedness is a mute attention to how governance works. He has failed to understand that governance is a continuum and no one can afford to isolate a period. More so that the same Fayose kept awarding contracts, owing workers, owing pensions and not honouring most financial commitments as itemised by PriceWaterHouse Coopers despite collecting Paris Funds. How does he think those transactions would be captured, Dipe asked? Figures don’t lie, especially when they are revealed by such a strictly professional firm like PricewaterhouseCoopers, which is neither a reckless nor a flippant auditing firm and which ranks as one of the Big Four auditors in the world along with Deloitte, EY and KPMG. This is the auditing firm that did the job, and this is the auditing firm that Fayose is contending with. He is however free to take the global firm to court to clear his name if he feels they have misrepresented his character. Although Gov. Fayemi had said that he would not be probing the Fayose era, it is however apparent that the ex-governor has been exposed for who he actually is: a greedy, exploitative insolent, whose tenure can only be remembered for looting and destroying. Even if the PricewaterHouseCoopers’ brief did not include investigating how Ekiti values were debased by the ex-governor, neither did it include how he destroyed people’s ancestral homes and seized their lands, posterity will still continue to judge Fayose, and nemesis will sooner than later catch up with him. Fayose also had the effrontery to call himself a friend of the masses, asking them to come out during the February election and vote for some of his people. He must realise that he is now a pariah in Ekiti and he is actually de-marketing those people he is supporting. A friend of Fayose, at this point is an enemy of the people of Ekiti, who the ex-governor scammed and deprived of their collective patrimony. Our people are much wiser now, never again will a person like Fayose lead them, even as a Ward Counsellor, Dipe assured. Senior Special Assistant to Ekiti State Governor on Public Communications.